If you are dealing with water seepage in your commercial service bay or pit, Edens Structural Solutions have the waterproofing services to solve this issue. Our service bay waterproofing team is experienced and uses proven solutions to dry out your bay and prevent any future water seepage issues. The Edens Structural crew is experienced in handling all types of service bay pits, whether they are brick, concrete blocks, or poured concrete. Each type of service bay requires different techniques in water removal and waterproofing. What do I do about water seepage? The answer is simple — Call Edens Structural Solutions. 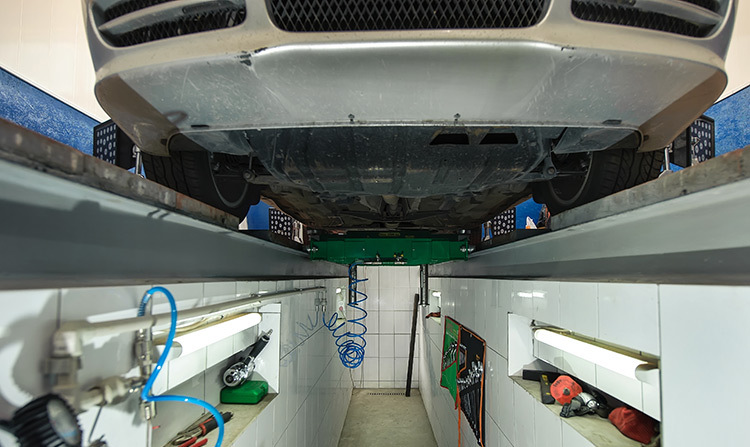 We have the experience and equipment to stop your service bay from leaking and ensure it’s waterproof. Our waterproofing process for service bays or pits is Hydrophobic Grout Injection. We pinpoint the source of the water from the inside wall, then inject a mixture of water and chemical grout into the leak. The grout expands, filling all voids and creating a durable, watertight seal. Upon completion of the waterproofing, the service bay is ready for years of additional service. Why is my service bay experiencing water issues? When the service bay was built a waterproofing system was not installed to begin with. The current waterproofing system was incorrectly installed, or it was damaged during the building’s construction. The ground water level has chnaged due to nearby construction. A nearby water main has burst, been damaged, or become blocked. There has been a higher amount of rain recently. How is the water seeping in? Probably from a joint or crack in the wall, but not necessarily. If the service pit is made from poured concrete walls, there will be a construction joint or kicker joint. This joint is weaker than the rest of the wall, and over time groundwater might seep in through that joint. Sometimes there might be other imperfections or cracks in the concrete walls or base, and it’s possible for water to enter these areas also. Some service bays are constructed with traditional bricks or concrete blocks. Once again, water could enter through any weak points in the brick or block joints. The joints between the floor and the wall can be a common place for water to come in. On newer buildings, it’s common for service bays to be formed from mass poured concrete and then a concrete block or brick layer built inside it. If water makes its way through both of those layers, the leak point can be more difficult to find and also to seal. However, we are experienced at even these types of repairs, and we simply use different methods to accomplish the same goal. In the end, you will still be pleased to see your service bay or pit completely dry! Please contact us for a free, no-obligation assessment! Click the link below to fill out our consultation request form.